Three Charles Darwin University (CDU) Bachelor of Education students have been awarded scholarships for their outstanding contribution to science education. Michelle Hickey and Peggy Neibling both received a $2000 Department of Education, Science and Technology (DEST) scholarship for outstanding scholarly achievement in science education using a new DEST-developed program Primary Connections. 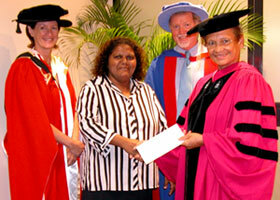 Julia Turner received a $1000 scholarship by CDU’s Office of Indigenous Research Education, recognising her involvement in a school community project that focussed on an Indigenous perspective using the Primary Connections program. The DEST awards presented to Ms Hickey and Ms Neibling aim to raise the level of interest in teaching science in primary schools and to promote the use of the Primary Connections program. Students who qualified for the award achieved an outstanding academic level in science education for 2007 and demonstrated an application of the Primary Connections program in the classroom. 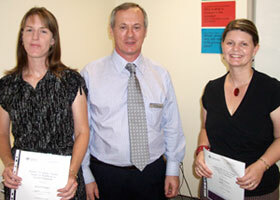 The DEST awards were presented at Education House, Queensland by CDU Education lecturer Dr Phil Keys, DEST Manager of Curriculum Division Mr Bob McAlister, and DEST Primary Connections coordinator for Queensland Ms Christine Purdie. Ms Turner’s award was presented at CDU’s Casuarina campus by Dean of Indigenous Research and Education Professor MaryAnn Bin-Sallik; Dean of the Faculty of Education, Health and Sciences Professor Graham Pegg, and Head of the School of Education Professor Alison Elliot.